Why Do We Manage Water Via Command and Control? And Is It Any Surprise We Are Constantly Having Shortages? In most commodities that we consume, market price signals serve to match supply and demand. When supplies are short, rising prices send producers looking for new supplies and consumers to considering conservation measures. All without any top-down intervention by the state. All without any coercion or tax money. But for some reason water is managed differently. Water prices never rise and fall with shortages -- we have been told in Phoenix for years that Lake Powell levels are dropping due to our water use but our water prices never change. Further, water has become a political football, such that favored uses (farmers historically, but more recently environmental uses such as fish spawning) get deep subsidies. You should see the water-intensive crops that are grown in the desert around Phoenix, all thanks to subsidized water to a favored constituency. 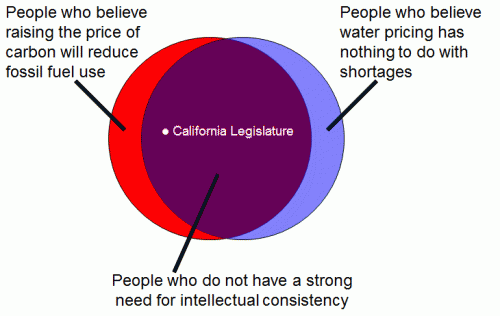 As a result, consumers use far more water than they might in any given year, and have no natural incentive to conserve when water becomes particularly dear, as it is in California. Senator Pavley said the state should consider measures that automatically take effect when a drought is declared to facilitate a more coordinated statewide response. Measures could include mandatory conservation, compensation for farmers to fallow land, restrictions on the use of potable water for hydraulic fracturing (“fracking”), coordinated publicity campaigns for conservation, increased groundwater management, and incentives for residents to conserve water. Senator Pavley noted that her hometown Las Virgenes Municipal Water District is offering rebates for customers who remove lawns, install rain barrels or take other actions to conserve water. Pavley also called for the state to create more reliable, sustainable supplies through strategies such as capturing and re-using stormwater and dry weather runoff, increasing the use of recycled water and cleaning up polluted groundwater basins. Note the command and control on both sides of the equation, using taxpayer resources for new supply projects and using government coercion to manage demand. Also, for bonus points, notice the Senator's use of the water shortage as an excuse to single out and punish private activity (fracking) she does not like. All of this goes to show exactly why the government does not want a free market in water and would like to kill the free market in everything else: because it gives them so much power. Look at Ms. Pavley, and how much power she is grabbing for herself with the water shortage as an excuse. Yesterday she was likely a legislative nobody. Today she is proposing massive infrastrure spending and taking onto herself the power to pick winners and losers (farmers, I will pay you not to use water; frackers, you just have to shut down). All the winners will show their gratitude next election cycle. And all the losers will be encouraged to pay protection money so that next time around, they won't be the chosen victims.